Last Sunday on March 23, I was fortunate to get invited for the exclusive launch party of Jifi, a product introducing whole new way of banking in B-Bar,Delhi. The meet was organised by Kotak Mahindra Bank in association with IndiBlogger. The special thing about this meet was that it was organised simultaneously at three places – Delhi, Mumbai and Bangalore. This meet was my 4th IndiBlogger meet and 2nd meet in that week. The registrations started around 12:00 pm and then Nihal from IndiBlogger team started telling about the agenda and all about the purpose behind the meet. We started eating snacks like chicken satay, chilli chicken, and assorted vegetable tempura. Since it was a bar, there were drinks too but since I don’t drink, I drank Coke and juice. Then Nihal said that we could use the laptops connected with Hangouts to talk to bloggers in Mumbai and Bangalore. When the event started, we were shown the live coverage of blogger’s meet happening at Mumbai since Mumbai was the place for one of the item in event agenda “Guess the guest”. Anoop from IndiBlogger was present there and asking bloggers who the special guest for the noon was. Someone guessed that it was a writer and Anoop rejected it completely(of course jokingly) but the guess was right as the special guest for the noon was Chetan Bhagat, the renowned author of bestselling novels in India. After that, he launched the product telling all about Jifi and doing promotion for the upcoming movie “2 States” based on his novel of same name shot in IIM Ahmedabad. To answer the questions of bloggers here in Delhi, Deepak from Kotak Mahindra Bank was present. He answered all queries and also showed ads for Jifi too. There were contests too like tweetathons, selfie contests and gaining highest points in Jifi account. I was one of the lucky winner after getting more than 1000 i.e. 1100 points in Jifi. After that, all of us ate lunch. 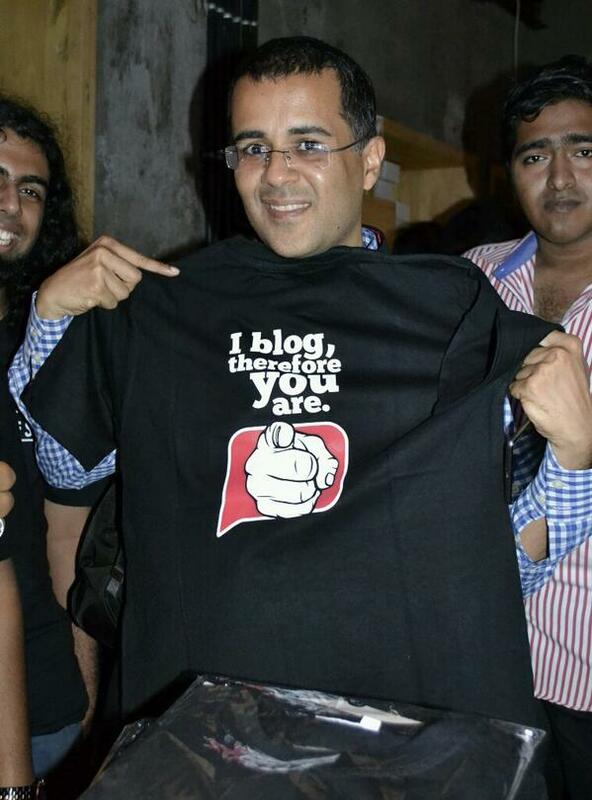 In the end, IndiBlogger t-shirts(the same one that Chetan Bhagat is showing) were given and all headed to home.